I must say that people are really interested in gold cutlery for a myriad of reasons from flavor to flair. The Yamazaki Cache Gold Accent set isn’t entirely gold but uses it as an accent, hence the name. 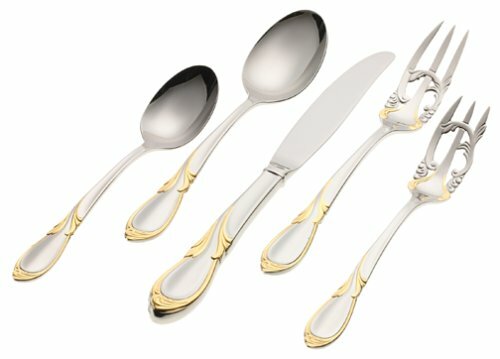 They say a picture says a thousand words and I think the photo above really shows it’s more than just gold that makes this cutlery set an amazing design. Made of dishwasher safe (but I wouldn’t trust gold to my dishwasher) 18/8 stainless steel this is a single 5 piece place setting that consists of a salad fork, dinner fork, knife, soup spoon, and teaspoon. A serving set is also available. Yamazaki provides a full lifetime warranty against defects, so if the gold does delaminate you can send it back. ← FlyingColors Laguiole Style Flatware Set – Cutlery with Color!